Sony (Booth C11001) is showcasing new solutions developed and designed collaboratively alongside media customers to creatively and cost-effectively bring their vision to life. The company champions the latest technology with the tools and support that empower professionals. The latest example is Sony’s recently announced HDC-5500 4K/HD HDR live camera system. Also on display are products for immersive imagery, workflow automation and management, cloud-based services, and system orchestration, along with mics, monitors, and camcorders. The Sony booth highlights two core areas: content value and workflow efficiency. Content value is demonstrated through 4K, 8K, high-dynamic-range (HDR) and high-frame-rate (HFR) technology, which supports creation of valuable, engaging assets. IP and media services offer workflow efficiencies that support interoperability, drive flexibility, provide automation, enhance collaboration and empower global distribution. Together, these solutions enhance creativity and increase options for professionals. 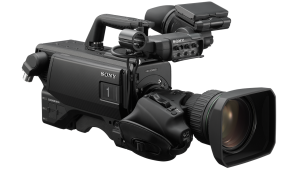 Sony’s HDC-5500 multiformat live camera is equipped with a 2/3-in. 4K global shutter three CMOS sensor. At the heart of the booth, the Crystal LED display system features immersive 8K x 4K imagery that proves “seeing is believing” and demonstrates why leading broadcast and global organizations have standardized on this dynamic visual experience for their most prominent spaces. Sony’s Intelligent Media Services transform traditional media chains, unlock more value for richer audience engagement, and provide OTT subscription services for additional digital and linear revenue streams through cloud collaboration, AI, IP, data analytics, and software automation capabilities. 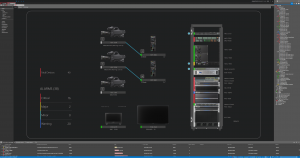 Intelligent Media Services is being shown in a variety of workflows for broadcast operations, as well as sports and production workflows. Integrated AI capabilities support object recognition, speech-to-text, and facial detection in Sony’s Ci Media Cloud, improving discoverability, searchability, and providing enhanced transcription. Ci also offers live contribution, streaming, and clipping for capturing and watching live streams anywhere. Crispin’s LoadingDock and FARlink software provide stations with the ability to aggregate program and commercial content from various locations in the cloud and on premises by using a centralized solution. Combining Crispin’s traffic interface and FARlink integration with Sony Ci, station groups have the ability to manage and execute playback of all of their content from the cloud. A content- and workflow-management solution in on-premises, hybrid, and cloud configurations. New features include an improved workflow editor with the ability to schedule workflow execution and native support for additional professional formats, including R3D, DNG, DPX, and EPS. A cloud-based service that bridges field-based camcorders with facilities, XDCAM air integrates with Media Backbone Hive, Media Backbone NavigatorX and third-party systems to provide streamlined acquisition workflows. New features include support for audio intercom functionality, HEVC (H.265) streaming, and multipoint-distribution streaming. Powerful HTML5 browser-based editing, including effects, subtitling, 16CH audio, and waveforms. Sony’s new HDC-5500 is a multiformat live camera equipped with the world’s first 2/3-in. 4K global shutter three CMOS sensor. The imager ensures superb image quality in 4K, HD, and HDR live-production applications. The camera is also capable of outputting 4K directly from the camera using a 12G-SDI interface, enabling 4K field monitoring and 4K HDR wireless applications. With new HDCU-5500 camera-control unit (CCU), the system offers ultra-high-bitrate (UHB) transmission, is capable of sending two channels of full 4K signals simultaneously, allows two signals to be sent to the CCU inputs or to send 4K images back to the camera for full 4K HDR monitoring capability. The new CCU provides 12G-SDI 4K output as standard and a SMPTE ST 2110 IP interface with a hardware option. The HDC-5500 also provides 4X HFR as standard and offers up to 8X HD and 2X 4K with a future-software option. The HDC-5500 system responds to the needs of 4K, HDR, HFR, IP, and wireless requirements for today’s and tomorrow’s production needs and will take our customer well into the future. The recently announced HDC-5500 and HDC-3500 systems offer compelling options for flexible and cost-effective migration paths from last generation technology. Live Element Orchestrator is intended to improve production-system availability, increase workflow efficiency. 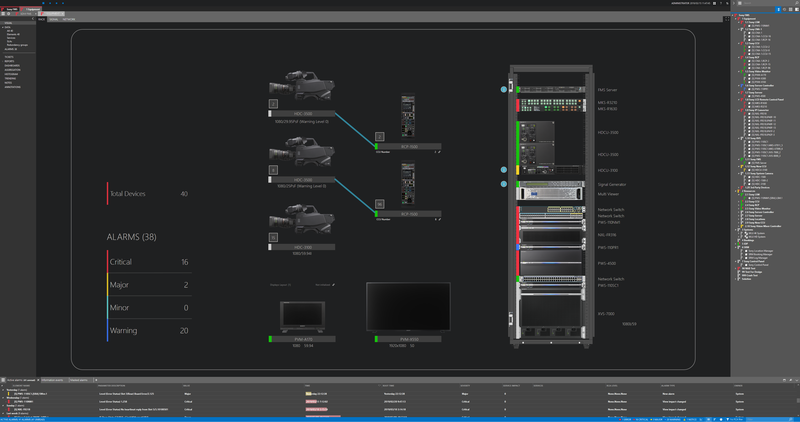 Sony is enhancing its IP Live Production Solutions with the Live Element Orchestrator, its first system-orchestration software to improve production-system availability, increase workflow efficiency through more-effective utilization of production resources, and to reduce system downtime, thereby improving productivity in content production. Resources can be shared across multiple locations and configurations. Sony’s two new SDI-IP converter boards — the NXLK-IP50Y and NXLK-IP51Y (12G-SDI) — offer support for SMPTE ST 2110 standards with optional format conversion and HDR compatibility. At Sony’s booth, visitors can see a full complement of IP Live production products supporting SMPTE ST 2110 in HD and 4K. In addition, the booth will be connected with Las Vegas’s HyperX eSports Arena, using a network provided by CenturyLink, for a remote-production demonstration over SMPTE ST 2110 using Live Element Orchestrator. Designed exclusively for high-end cinematography, VENICE continues to deliver exceptional images and complete flexibility, creative freedom, and its established workflow to match filmmaker’s shooting requirements. Recently released version 3.0 software added two new imager modes: 5.7K 16:9 and 6K (full-width) 2.39:1, as well as X-OCN XT and Cache REC. Version 3.0 software also enables the use of Sony’s new portable and lightweight CBK-3610XS Extension System, which allows for cabled separation between the VENICE camera body and image sensor block. In addition, Version 4.0 firmware was recently announced, which adds HFR shooting of 4K 120 fps and 6K 60 fps with an optional license. Version 4.0 firmware is planned to be available in June. Announced at IBC 2018, the BVM-HX310 is making its NAB Show debut. Suited for 4K HDR color grading, shading, and QC applications, the BVM-HX310 supports wide color gamut, including DCI‑P3, ITU‑R BT.2020, S‑Gamut3.Cine and S‑Gamut3. The advanced performance of the TRIMASTER HX panel enables the BVM-HX310 to achieve 1,000 nits of full-screen brightness with a 1,000,000:1 contrast ratio. With consistent and faithful color reproduction over the entire luminance range, it is an excellent tool for digital cinematography and post production workflows. In addition, the BVM-HX310 has useful functions such as User LUT, Quad View and automatic HDR setting by VPID for various workflows. Sony’s Xperia 1 is a 4K OLED smartphone with a 21:9 CinemaWide 6.5-in. display. Creator Mode (ITU-R BT.2020 support and 10-bit tonal gradation) is inspired by Sony’s Master Monitors for accurate color reproduction. Cinema Pro “Powered by CineAlta,” provides natural cinematic shooting experiences with expression-based color management pre-sets. Version 3 firmware for the LMD-A240, LMD-A220, and LMD-A170 offers HDR production enhancements supporting multiple EOTFs, such as SMPTE ST 2084(PQ), ITU-R BT.2100(HLG), S-Log2, S-Log3, S-Log 3(Live HDR) and 2.4(HDR). Switching EOTFs, maximum brightness is automatically set. Already supporting ITU-R BT. 2020, the monitors are capable of accurate color reproduction in HDR with a lower cost than conventional 4K HDR monitors. Sony’s popular PXW-FS7 and PXW-FS7 M2 XDCAM camcorders will be optimized for newsgathering with the new CBK-FS7BK ENG-Style build-up kit and an LA-EB1, B4 lens to E-mount adapter. The build-up kit enables ENG like operator experience, while the LA-EB1 allows operators to shoot deep Depth of Field (DoF) with the high zoom ratio necessary for traditional news production. The build-up kit also features an extension unit with a wireless-audio-receiver slot, and built-in wireless capability provides advanced network operation for broadcast use. With a new compact and lightweight design, the latest UWP-D wireless microphone series offer NFC sync for easy and fast channel setting and supports a Multi-Interface Shoe (MI shoe) with Digital Audio Interface that achieves high-quality sound with low noise for Sony’s PXW-Z280 and PXW-Z190 XDCAM camcorders. The new UWP-D series provides advanced integration with the camcorders for enhanced usability. The PXW-Z280 and PXW-Z190 will enhance their capabilities with Version 3.0 firmware, which includes wireless file transfer with Dual Link connection, file transfer without the use of a mobile app, and support for a Multi-Interface Shoe with Digital Audio Interface to enable superior sound and enhanced usability for the new UWP-D wireless microphone series. Sony’s newest 4K pan-tilt-zoom (PTZ) camera, the BRC-X400, is ideal for cost-efficient content creation, including broadcast applications and shooting in large venues. The camera supports IP and is equipped with NDI|HX capability with an optional license. When released in the fall, it is planned to be compatible with REA-C1000, Sony’s first AI-based video analytics solution. The new HXR-MC88 palm-sized camcorder enables cost-effective and professional-quality HD capture that responds to the growing demands for video content in various scenes including education, corporate, and government environments. With a large, 14.2-megapixel 1.0-type stacked Exmor RS CMOS sensor, users can capture high-quality images with less noise in both light and dark conditions. The camera also features a Fast Hybrid Auto Focus system for seamlessly capturing motion. Additional highlights include built-in four-step ND filters and 12X optical zoom, which can be doubled to 24x with Clear Image Zoom while maintaining full resolution using Super Resolution Technology and 48X zoom with Sony’s Digital Extender. The PZW-4000 4K XAVC recorder supports XAVC-L422 QFHD 200 recording/playback along with XAVC-I QFHD 300. It also allows direct playout from SxS memory cards, without ingesting media into an internal SSD, in addition to simultaneous recording to the internal SSD and SxS card. A VTR-like, simple control panel is included, enabling professional users to easy-to-control operations by their familiar and experienced skills. The SBP-120F (120GB) and SBP-240F (240GB) are the newest addition to Sony’s durable and reliable SxS PRO X Card line-up. Both offer ultra-fast transfer speeds of up to 10 Gbps and enable stable capture of high-bitrate content. Used in conjunction with the new reader/writer, SBAC-T40 equipped with Thunderbolt 3 interface, enables transfer of 240 GB of video content in approximately 3.5 minutes. For more information about Sony’s latest professional technologies, visit pro.sony.